I-80 / US 75 in Omaha, Neb. Interstate 480 (I-480) is a 4.90-mile-long (7.89 km) auxiliary Interstate Highway that connects Interstate 80 in downtown Omaha, Nebraska, with Interstate 29 in Council Bluffs, Iowa. The portion of I-480 in Nebraska has been named the Gerald R. Ford Expressway, named in honor of the former President, who was a native of Omaha. For most of its length, I-480 is overlapped by a U.S. Highway; for two miles (3.2 km) with U.S. Route 75 and for one mile (1.6 km) with U.S. Route 6. I-480 includes the Grenville Dodge Memorial Bridge over the Missouri River. Interstate 480 begins at an interchange with Interstate 80 to the east and west and with U.S. Route 75, known as the Kennedy Freeway, to the south. Going north, I-480 passes the Hanscom Park neighborhood to the west and the Vinton Street Commercial Historic District to the east. At exit 1A, I-480 intersects Martha Street, which before January 1, 2003, was the eastern end of Nebraska Highway 38. North of Martha Street, I-480 passes the Gerald R. Ford Birthsite and Gardens. At the Leavenworth Street exit, the highway divides the Leavenworth neighborhood from the Old Market neighborhood. Shortly after the Leavenworth Street exit is the Harney Street exit, which provides access to U.S. Route 6 from eastbound I-480. before the North Freeway interchange, I-480 passes beneath Dodge and Douglas Streets, which are the westbound and eastbound lanes of U.S. 6, respectively. Just to the southwest of the Creighton University campus is the North Freeway interchange, where US 75 leaves eastbound I-480 and joins westbound. The North Freeway was originally planned to be an Interstate Highway, "I-580", connecting northern Omaha to downtown, but this project was canceled with the interchange in midst of construction. A number of so-called ghost ramps can be found, but these are being eliminated during the reconstruction of this interchange. Here, I-480 turns to the east towards Council Bluffs, Iowa. I-480 passes between the NoDo and Downtown Omaha neighborhoods. Farther east, it dips to the southeast near CenturyLink Center Omaha, part of the "NoDo" neighborhood. Immediately before crossing the Missouri River, U.S. Route 6 joins I-480 to cross into Iowa. This bridge over the Missouri River was constructed in 1965 – 66 to replace the old Ak-Sar-Ben Bridge which had been the first highway bridge across the river in this area. Upon entering Council Bluffs, I-480 meets up with Interstate 29 just 3⁄4 mile (1.2 km) from the Missouri River. On the other side of this interchange, I-480 ends where U.S. 6 traffic encounters signal-controlled intersections. The I-480 bridge over the Missouri River between Council Bluffs, Iowa and Downtown Omaha, Nebraska. In the late 1950s the construction of what was then referred to as Route 3 was highly controversial. 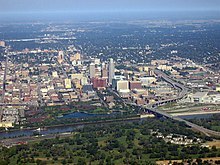 It conveniently crossed through the western and northern edges of Downtown Omaha, two areas city leaders had considered "blighted" since the 1930s. The heavily Catholic, ethnic European neighborhoods the route went through rallied against the demolition of their homes, and the city's parks advocates provided resistance as well. Eventually the Interstate planners won out, and the city's historic Jefferson Square was demolished, as well as dozens of homes along the route. In 1999, a bill was introduced in the United States House of Representatives that would have extended I-480 south along U.S. Highway 75 in southern Omaha and in Bellevue, Nebraska, then east through Plattsmouth to connect with Interstate 29 near Glenwood, Iowa, increasing the length of Interstate 480 to 19 miles (31 km). However, this bill was tabled in the committee. In 2004, the Nebraska Department of Roads began a project to reconstruct the I-480 / US 75 interchange. Work took place in three phases spread out over the course of six years. The final phase of the $52-million ($57.9 million in 2019) project was funded with $13 million ($14.5 million in 2019) in American Recovery & Reinvestment Act stimulus money. The project was completed in May 2011 just in time for the College World Series. ^ a b "Nebraska Highway Reference Log Book" (PDF). Nebraska Department of Roads. 2015. pp. 309–310. Retrieved January 8, 2017. ^ a b c "2009 Volume of Traffic on the Primary Road System of Iowa" (PDF). Iowa Department of Transportation. January 1, 2009. Retrieved July 21, 2010. ^ Iowa Department of Transportation (1996). The National System of Interstate Defense Highways 1956–1996. ^ Federal Highway Administration. "Route Log – Auxiliary Routes of the Eisenhower National System Of Interstate and Defense Highways – Table 2". Retrieved March 7, 2010. ^ "End of the historic road as Nebraska Highway 38 goes off the map". Omaha World-Herald. January 10, 2003. ^ Daly-Bednarek, Janet R. (November 1, 1992). The Changing Image of the City: Planning for Downtown Omaha, 1945-1973. University of Nebraska Press. pp. 152, 177. ISBN 0-8032-1692-0. ^ "Grant – Award Summary". American Recovery and Reinvestment Act of 2009. Retrieved August 18, 2012. ^ Staff (2011). "I480/US75 Interchange Downtown Omaha" (PDF). Annual Report. Nebraska Department of Roads. p. 12. Retrieved August 18, 2012. This page was last edited on 18 May 2018, at 02:28 (UTC).